by Katinka RichterÁrni Vilhjálmsson, Friðgeir Einarsson and Ragnar Ísleifur Bragason togheter forms the islandic group Kriðpleir Theatre Group. Their performance Crisis meeting is one of the international guest performances at the biennial. How did you come up with the idea of the performance? The idea was born out of lack. After having done a few successful projects together we naturally decided to go for one more. But since we didn’t really have an idea, we sat around a table for several days and discussed what would be possible. Pretty soon the conversation drifted off topic, we discussed our lives, all the banal and trivial things that gets in the way of making art. We got to know each other better, our friendship deepend. We started to open up to each other; Ragnar for example told us about a peculiar period in his life and details of his relationship with his mother – things that utterly amazed us. Luckily, Bjarni had been casually transcribing our conversations on the computer, so once we had developed the concept we had plenty of text to work from. In a review it says that you “blur the lines between fact and fiction”, how did you work with these opposites? In Crisis Meeting – like in everything we work on together – we use our own names and talk about experiences from our own lives. The characters we portrait are in that sense our alteregos, or extensions of ourselves. However, the sequence of the performance, our interactions and the plot, is mostly scripted, and in that sence ’fiction’. So our performances are a mix between factual anecdotes and things we make up. We feel this creates a dynamic friction between what is real and what is fiction; the fiction creates a safe space to use real stuff as material, and the real stuff taints the fiction with credability. I have read that your aim with the performance was to restore your self-confidence. Do you have any tips for fellow performance artists that need the same sort of self-confidence-boost? 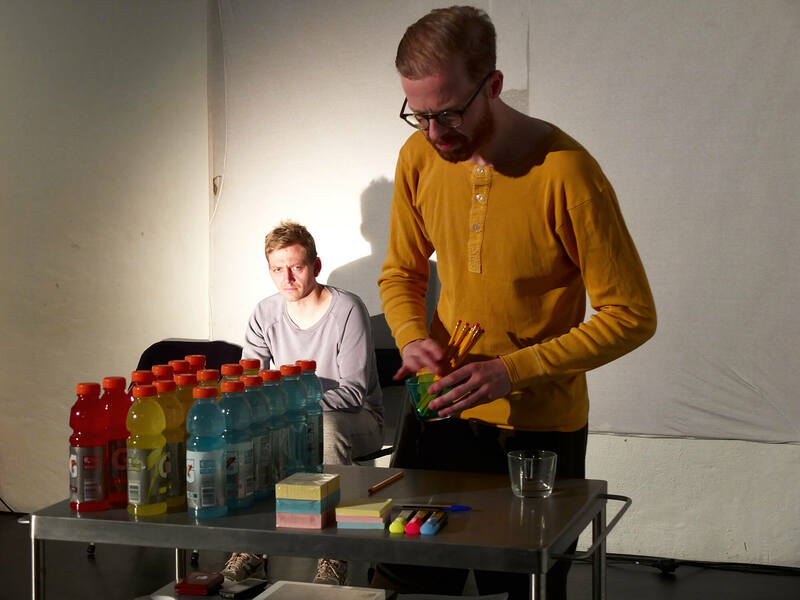 In Crisis Meeting we present several methods that audience members can use to improve themselves as human beings – things that we have been experimenting with to improve ourselves as artists. We suggest that all people – performance artists included – come see the show, for better confidence and all sorts of improvement. Trying to explain your methods and by that, as you describe it, “producing a stream of consciousness”, what was the most surprising thing you found out about yourself? We found out that we are different characters and in our performances we can show our own identity and our fake identity on stage, without sometimes realizing ourselves which is which. In the description of the play it says that the performance is juggling between anarchy, sitcom and Beckett, could you describe in which way? The sitcom factor comes from the fact that we are always working with the same characters in all our performances. These characters – that are a sort of extensions of ourselves – find themselves in new situations in every piece; a mess that they have created themselves and have to figure out. The characters that we work with have a certain dynamic between them, and high ambitions. But they are also quite erratic at points, disorganized and chaotic, which attributes to the comedy. The repetition of this theme makes their existence in a way ’Becketesque’; they sometimes seem to be locked in the world of the stage, waiting for something to happen or unfollowed. Why should the visitors of the biennial see Crisis meeting? We would like to really open up to the audience and really let them in on what we´re doing. Because we believe that we may have some ideas and methods that could interest those who are into the arts. That is people like you. How would you describe Crisis meeting with only three words? Enlightening, entertaining and perhaps a tiny bit theraputic. Crisis meeting will be showed in Hemerycksalen on Wednesday 24 may at 12:00-13:20 and at 20:00-21:20. The performance will be in english.